If you’re like most people you have your nice towels and your old towels that you use for dirty stuff like dying your hair and washing the dog, and I am no different, but I have been making my “good” towels last a little longer recently because well, I have better things to spend my money on, like shoes! I have pimples and use a face wash with benzyl peroxide, which as you may know bleaches any fabric it touches so I get nice bleach stained towels along with the general fading that goes along with washing towels. Fun stuff I know! Instead of buying new towels all the time I started dyeing them with Rit dye. Rit is the kind that comes in the box of powder or the little bottle of liquid. It can be found at most craft and sewing stores, and I think some stores like Wal-Mart carry it. I usually buy the powder because it’s cheaper, usually around $2-3. I just pour it in a sink full of hot water and let my towels soak for about 15 min. I always do my dyeing in my kitchen sink so I can use both sinks, one for dyeing and one for rinsing. Oh and always wear gloves when dyeing, or you will have dyed hands! After that I rinse it our and wash the towels in the washing machine on normal settings. I use black because all of my hand towels are black, it’s easy to match to and easy to dye. 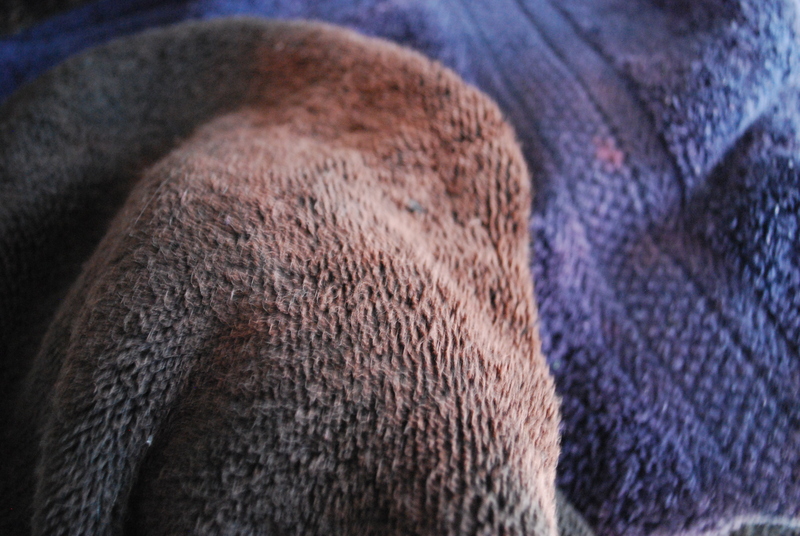 I would recommend dyeing your towels a dark color because it is easier to dye. Hopefully this saves someone from having to buy new towels! My next post will be about the curtains I dyed. I’m a big fan of self dyeing if you can’t tell. I just started using it about a year ago and wish I would have started sooner. I can’t tell you how many pairs of jeans I’ve redyed!